Before I start with this string of thoughts..I have to say I am convinced there is no right or wrong answer. In fact, labels in general make me nervous when it comes to creative work. But recently, I have been thinking a lot about the creative process and what my reason is for doing what I do. I think I fall more on the process side, but let me explain how I got there. “Product” knitting, spinning, or weaving is motivated by the finished item more than the time or journey it takes to get there. I am very much a product weaver..I don’t love warping the loom, and I enjoy the weaving part but I love, love, love the moment of unwinding a piece from the loom and looking at the fabric I made. For spinning I am mixed. If it’s art yarn, I love the process. More utility yarn becomes a zen like process, but I still want to get to the final yarn so I can make something from it. On the other hand, I love washing and preparing a fleece to spin..and there’s nothing efficient or quick about that. Knitting is a mix as well, but I am more of a process knitter. For a long drive, flight or TV show I have to have knitting in my hands. I like detailed patterns..I would rather have an interesting challenge than a fast knit. In fact, my channel cardigan took several weeks, but as I wrote earlier, it carried me through a difficult time. I’ve been spending a lot of time recently on designing sweaters. During that experience I have realized how much of a process knitter I am. I like details, and I like changes. If it begins to feel routine, I don’t enjoy it as much. When I took Josh Bennet’s design class at Vogue Knitting Live, we had 1:1’s with him at the end, and he have me a piece of advice that was probably the best I will ever get when it comes to design. I was debating between two techniques for the front of my sweater. One idea involved a lot of weaving in ends and I was concerned people would consider that tedious. He said “Don’t ever dumb down your designs to make them easier..it doesn’t honor you or the people you are designing for.” Simple advice, but golden. So how about you? Are you a product or process maker? This entry was posted in Fiber Friday, Fleece Processing, Inspiration, knitting, rigid heddle weaving, Spinning and tagged channell cardigan, handknit, handspun, josh bennett, rigid heddle weaving by Leah. Bookmark the permalink. Hmmm. I think I am probably a product oriented person, in that I wouldn’t do this just as a hobby like playing WoW without a tangible payoff – but much of my meditative time is spent in spinning, knitting, and weaving, so I would say the process is important to my well being too. It’s a good blend, isn’t it? I do love the meditative side of knitting!! I used to think I was a process knitter, but I think my real answer is “it depends.” I’m knitting a really complicated lace shawl right now, and it’s definitely more about the challenge for me than the finished product. I have no idea if or when I will ever use it. On the other hand, there are a lot of things I’ve made recently, summer tops and such, that are much more about the finished item. I wanted some knitted items in my wardrobe to wear THIS SUMMER. I wanted useful shapes and wearable fabrics. I got through the knitting (a lot of stockinette) but I can’t say I was invested in the process the way I am with this shawl. 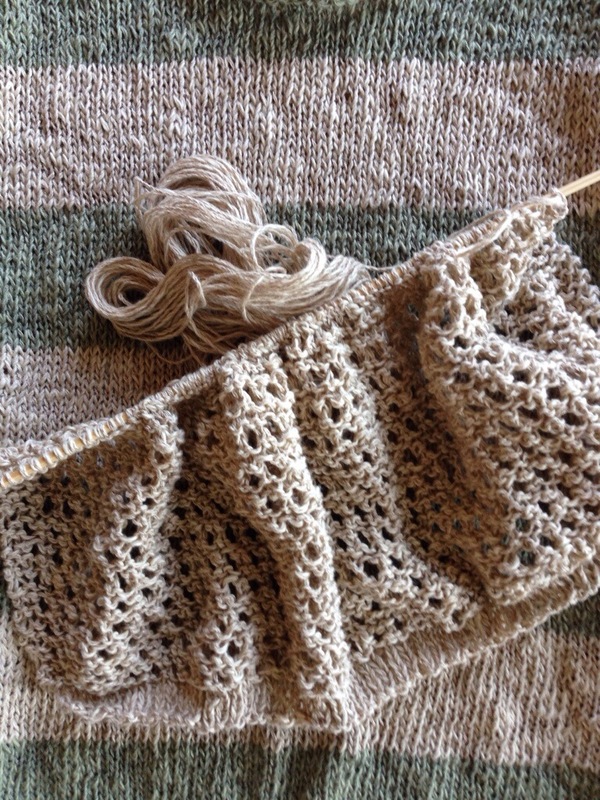 For a while now I have more into the knitting process – I can’t anything that I don’t find challenging or impossible. (Well, except for the occasional beanie that someone needs) Weaving is all about the process too still, Because I am so new at it. Spinning is the hard one. I definitely am more focus on he product. But I get “spinning cravings” where I really just want to spin…something! p.s. That was great designing advice indeed! And, there is something to be days for the occasional beanie!! But I agree with you..seeking out the challenge is a big part of the process! Cool!! After looking at your designs on your blog, it’s nice to know that was a good piece of advice to share! You’ve got some awesome design work there!! I’m definitely a process knitter and spinner. I enjoy the making of yarn or a garment and am motivated by the process of creation more than the idea of a finished object. That’s awesome that you know yourself that well!! Do you tend to go for more complicated projects or easy paced ones? I usually have one easy one on the needles as a ‘take-along’ project and a more complicated one for home. It’s a good thing that I am a process knitter/spinner as I live in the tropics and only get to wear knits when we travel to cooler places.